Why do they make hardwood in layers instead of using solid wood? Is Engineered Wood Flooring with a thick sawn top wear layer better than a real solid wood floor? Engineered wood flooring will have unique characteristics in relation to regular solid wood flooring. The main difference is how the flooring is constructed by using two components. These two components consist of the ‘core layer’ and the ‘face veneer’. The core layer is constructed of multiple layers of alternating exotic hardwood species. These layers are placed in a cross-hatch configuration. This essentially balances out the natural tendency that wood products have to expand or contract in relation to changes in humidity. Once the extremely stable core layer is produced, then the face veneer is added. This veneer is dry sawn in a similar method to solid wood flooring. By sawing the woods in similar ways the finished product looks identical to solid flooring once installed. Click on this link to see a video on how this process works. Within the coastal region of San Diego we have several different climate zones that can affect how your hardwood floor looks over the years. Using high quality sliced engineered hardwood flooring in San Diego can give you the look that you desire as you can achieve the identical look of solid flooring, while also using less raw materials and therefore being more environmentally responsible. This type of product will often be more stable than solids and is less likely to suffer from seasonal gaping and humidity changes that are so prevalent in wider solid floors. 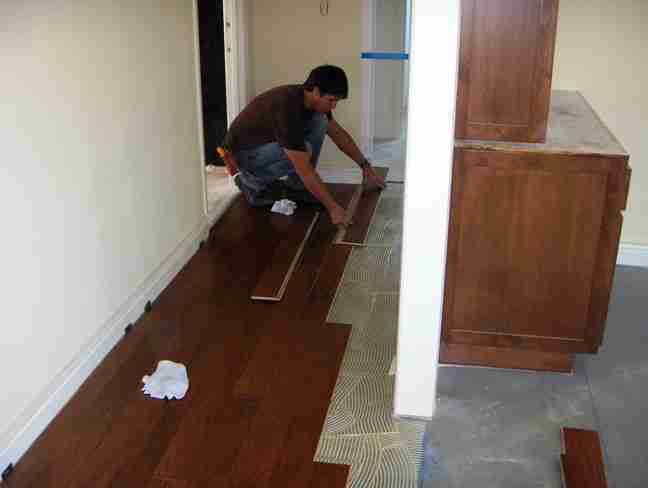 Engineered is the preferred method by many flooring professionals in the San Diego Region. Another method of producing engineered hardwood flooring is the rotary pealed method that is used in many lower priced products. The logs are literally pealed in a round circle in the same direction as the rings of the tree. Typically when you find a very thin top wear layer or face, the log has been pealed and will give you more of a plywood look in the grain as opposed to the pristine look of a solid sliced cut log.